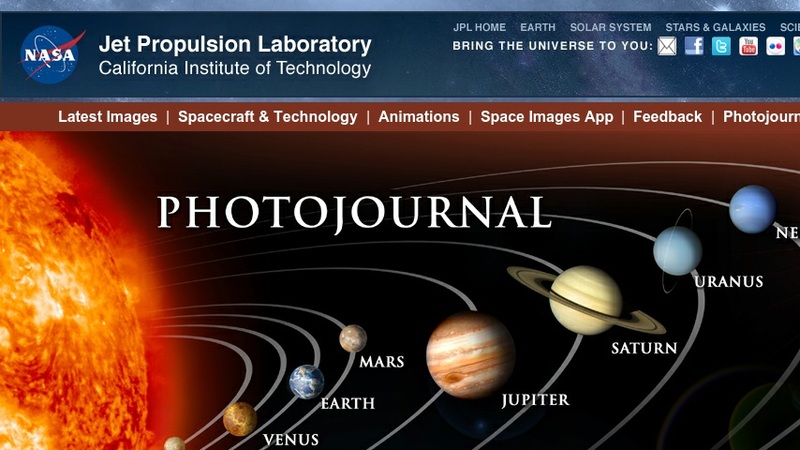 Photojournal is the interface to NASA's Planetary Image Archive (PIA), which features thousands of high-resolution images and other products generated by various Jet Propulsion Laboratory (JPL) missions. The home page features an interactive illustration of the Solar System that provides access to images of the eight planets (plus Pluto), the Sun, and the universe. Images are accompanied by a title, mission and instrument data, date, image size, and links to download or view them in a choice of two file formats. There are also pages featuring images with specific themes: the latest images, animations, spacecraft and telescopes, and dwarf planets.